The iPhone 8 and 8 Plus are available now. Here are the places where you can get your own. iPhone 8 and iPhone 8 Plus: How much does it cost? They've arrived: The iPhone 8 and 8 Plus are now available. Apple has skipped the standard “S” release and headed straight to prime time with the 8, and there are plenty of new features to make it exciting—including wireless charging, a glass back, and a new TrueTone LCD display. Now that you’ve had time to drink in all the details, it’s time to get your own. Apple’s online store may seem like the most obvious choice, but you can also get it from the Apple Store app for iOS with Apple Pay, which has worked very smoothly for us in the past. Besides Apple, the four major cell carriers are also eager to help their customers upgrade or switch to a brand-new iPhone—especially if it means renewing a contract, extending an installment plan, or signing up new customers. You can also get the iPhone 8 and 8 Plus through retailers like Best Buy. Read on for more iPhone 8 buying info. Looking for details on the iPhone X? That one doesn’t ship until November 3, unfortunately—but preorders will begin October 27. The iPhone 8 comes in two models and starts at $699. The iPhone 8 Plus also comes in two models, but starts at $799. If you want AppleCare+, that will set you back an additional $129 for the iPhone 8 and $149 for the iPhone 8 Plus—which is a price increase for the larger models. Both the iPhone 8 and iPhone 8 Plus come in silver, gold, and space gray. Apple’s online shopping portal has been up since last week, in order to accommodate preorders. As of September 22, the expected ship date is 1-3 business days for most carriers and most colors. However, at the time we checked, the Verizon 64GB silver model was a 1-2 week wait, as was the Verizon 128GB space gray model. If your carrier is AT&T, Sprint, or Verizon, you can check your upgrade eligibility directly on Apple’s website. You can also enroll in the iPhone Upgrade Program online. If you’re a T-Mobile customer, you’ll have to pay in full to place an order through Apple. If you want to participate in the iPhone Upgrade Program, T-Mobile customers will have to go to an Apple retail store (sorry, Apple Town Square) in person. The cost of the iPhone Upgrade Program includes AppleCare+, which would be an additional charge of $129 for the iPhone 8 and $149 for the iPhone 8 Plus if you were to pay for the phone in full up front. If you’re an AT&T customer (or would like to become one), you can also order your new iPhone 8 on AT&T’s website, where you can check your upgrade eligibility and select one of their Next plans. AT&T Next lets you get a new iPhone 8 for $0 down as long as you make monthly payments, starting at $23.34 for the iPhone 8 and $26.67 for the iPhone 8 Plus, spread out over 30 months (with a 24-month option available). You can upgrade to a new iPhone once 80 percent of the iPhone’s sales price is paid off (or sooner with a down payment). The AT&T Next Every Year plan has larger monthly payments but you can upgrade after a year—or once you’ve paid off half of the price of your device—hence the name. Verizon also offers purchases online. 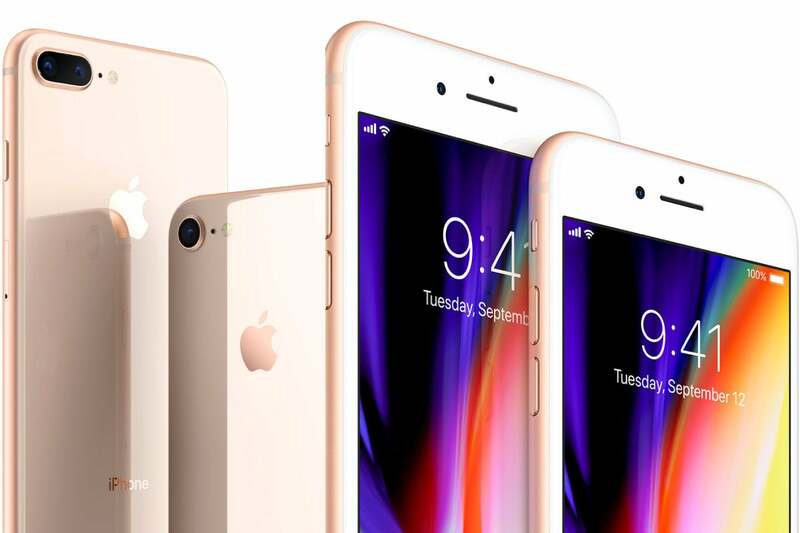 This year, if you trade in a phone (Verizon's taking phones as old as the iPhone 5), you can save up to $300 off of your iPhone 8. Your trade-in device must be in good working and cosmetic condition, of course. Verizon is also offering the option to pay for the phone in full or through a 24-month installment plan. Sprint's purchase options for the iPhone 8 and iPhone 8 Plus focus on offering low monthly prices for new Sprint customers. If you switch to Sprint and want an iPhone 8, you can slash your monthly payments in half if you bring in an eligible device to trade in with Sprint Flex. For iPhone users, that means an iPhone 6/6 Plus, iPhone 6s/6s Plus, or iPhone 7/7 Plus, which brings the cost down to $14.58 per month ($29.17 with no device trade in). For the iPhone 8 Plus, a Sprint Flex trade-in will save you up to $260, bringing your payments down to $18.75 per month ($33.34 with no device trade in). Sprint requires a down payment of $150 for the 256GB models, but there’s no down payment for the 64GB devices. Existing customers can log in to their Sprint accounts to view personalized offers. All monthly payment-based iPhone plans come with Sprint’s iPhone Forever program, which lets you trade in your phone every 12 months. Sprint’s iPhone Forever program is technically a 22-month lease. T-Mobile customers will likely find it easiest to buy an iPhone 8 or 8 Plus directly from the carrier, as it's the only way to get access to a standard installment plan for payment. If you have an iPhone 6 or newer to trade in, T-Mobile will knock $300 off the price of the iPhone 8 or 8 Plus via 24 monthly bill credits. For current T-Mobile customers on the Equipment Installment Plan (EIP), you have to pay off the remaining balance on your existing device before adding the iPhone 8 to your line. While Best Buy isn't offering any trade-in promotions, the big-box retailer does offer the option of 24-month installment plans to AT&T, Sprint, and Verizon customers. T-Mobile subscribers will have to pay the full price of the phone. Best Buy also lists both expected ship dates as well as real-time information for store availability on its site. Our check of the site shows one-hour pickup times in San Francisco for most iPhone 8 and iPhone 8 Plus models, though the space gray models with larger capacities do have expected shipping dates and in-store availability of a week or more.